Ashored Innovations, a young venture that aims to help automate the lobster and crab fisheries, captured the $3,000 first prize at Dalhousie University’s Collide Fall 2017 Pitch Competition on Thursday night. 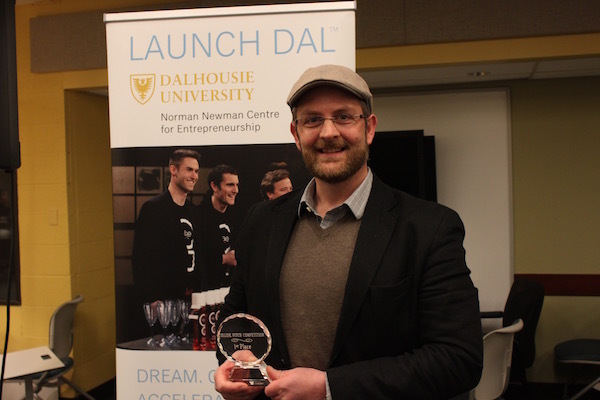 LaunchDal, the university’s entrepreneurship program, awarded a total of $6000 to three early-stage businesses at the event. Ashored is developing an “intelligent buoy”, which can be used to locate lobster or crab traps at sea. The buoy’s rope is coiled on the trap until the fishing boat approaches, which reduces the risk of whales becoming entangled in the gear. There is a backup system in case the buoy doesn’t deploy, decreasing the risk of lost traps. And the system collects data, which can be used to improve operations. On Sunday, Ashored also won $1000 at Dalhousie’s Launch Oceans event, a weekend-long program for oceantech entrepreneurs that follows the Startup Weekend format. Aaron Stevenson, Founder of Ashored, said the recent winnings will allow the company to build its prototype and begin testing the buoy with a few partners. KNIT, which is proposing a social network for the elderly, won the $2,000 second prize at the Collide event, and Si Connectors, which is making an inexpensive device that can fix broken phone or computer chargers, took home $1,000 for third place. The competition is the final event that rounds off the Collide fall program. Collide is a series of workshops and pitching sessions to help individuals build and potentially launch a company with the chance to win prize money.